Celebrating 2 years of hard to achieve EXCELLENT Food Safety Ratings from the Public Health Department!! A huge THANK YOU to our kitchen and team for the amazing perfect score!!! Restaurants receive one of four food safety ratings to provide the public with more information about the level of a restaurant’s food safety practices, helping them make informed decisions about eating out. If a restaurant is open for business it meets minimum food safety standards to operate. • Excellent: The restaurant has had No or Few red critical violations over the last four inspections. • Good: The restaurant has had SOME red critical violations over the last four inspections. 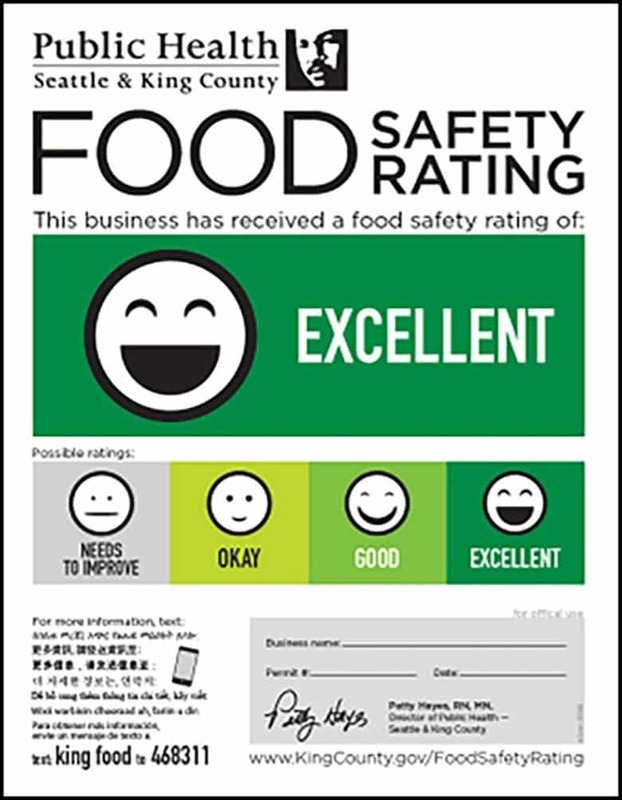 • Okay: The restaurant has had MANY red critical violations over the last four inspections. • Needs to Improve: The restaurant was either closed by Public Health – Seattle & King County within the last year or the restaurant needed multiple return inspections to fix food safety practices.